My neighbour has rallied, thank goodness, because (I'm purely selfish about this) I like having her to dinner and to talk to and go out with. On Thursday we managed to catch the last of the spell of glorious weather and get down to the rose gardens. It was probably the wet winter followed by the dry warm spring, but Wellington's roses are magnificent this year - even mine, which get minimal care and attention (though they do get very well pruned, thanks to a kind expert friend). 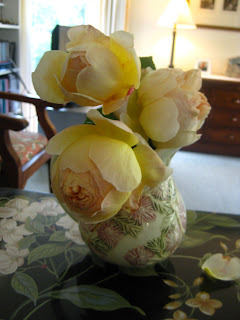 Here's Jude the Obscure - it lasts hardly any time in a vase, but its fat round apple-scented blooms are worth bringing in even for just a couple of days. My main preoccupation this week has been sorting stuff out. Or rather not sorting stuff out. I'm extremely good at avoidance behaviour when it comes to difficult tasks like this. It's partly because I knew it would involve dealing with lots of nostalgic reminders of the past - papers, photos, cards, and the last small hordes of things that belonged to Harvey, like his hairbrushes. . His computer was finally taken away this week. I know it's a hopelessly melodramatic, overblown comparison, but turning it off for the last time felt like turning off life support. 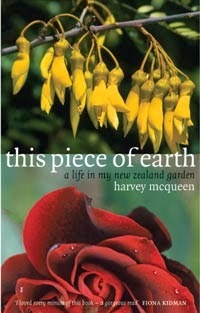 And I found a tape of a radio interview he did in 2004 for his garden memoir, This Piece of Earth. I didn't think I had any recording of his voice. So now it's nearly Christmas again. I'll be with family this year, including a great-nephew enjoying his first Christmas, while visitors mind my house. I've made the pudding I'm taking, but I haven't sent a single card or done much shopping. I must admit that the Christmas buzz I used to really enjoy is missing, but I suppose that's only to be expected. Meanwhile there's also lots to do in preparation for the food memoir launch next March, such as writing articles and getting to grips with social media (I know, I've written about this before but I mean it this time). Watch out for a whole new clutch of useful buttons appearing here and over on Something Else to Eat. I meandered over to Elsewoman from Something Else To Eat and am touched by the simplicity and elegance with which you share these tender experiences. Your photos, especially seeing how you bring beauty into your environment (flowers indoors), are a great reminder for me to feed my need for beauty. Elsewoman IS something else to eat! What a lovely comment, Michelle, thank you! It gave me a real boost. Go back to that Lois Daish post to see my reply to your comment and request there. Yes, it will. Have a look at my new Facebook page about the book too - Anne Else Food Memoir.